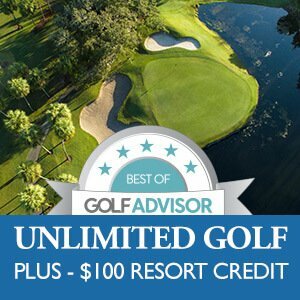 The price for the Unlimited Golf Spectacular Package starts at $226 per person per night double occupancy. Two-night minimum. Suite, villa, single/triple occupancy and non-sportsman rates available on request. Call us direct at 352.324.3101 or 800.874.9053 (toll free) for details. To check availability and book online, click the button below. You can also call us direct at 352.324.3101 or 800.874.9053 (toll free). Gratuity, tax and resort fee are not included. Suite, villa, single occupancy and non-sportsman rates available on request. The price is per person per night based upon double occupancy; two night minimum required. Some blackout dates apply. Resort fee, gratuities and applicable taxes are extra. Based on double occupancy, 2 night minimum. Package pricing is per person per night, based on double occupancy and a two-night minimum stay. Applicable taxes, service charges, and resort fee are additional. A one night deposit will be charged at time of booking. A 72 hour cancellation policy is required to avoid a one night penalty.